The Washington Nationals continued to stay hot and gain ground in the National League East as they picked up their 12th win in their last 14 games yesterday with a 2-1 win on the road against the Arizona Diamondbacks. However, even in this stretch, the Nationals still have a very serious concern that doesn’t seem to be going away, the injuries. The Nationals announced before their game yesterday that they have placed first Baseman Ryan Zimmerman on the 10-day disabled list with a strained right oblique. The Nationals called up first Baseman Mark Reynolds from Triple A-Syracuse and right-hander Joaquin Benoit, who is still recovering from a right forearm strain, has been moved to the 60-day DL to make room on the 40 man roster. The transactions are finally official: Ryan Zimmerman to 10-day DL with a strained right oblique, Mark Reynolds contract purchased from AAA, Joaquin Benoit transferred to 60-day DL. 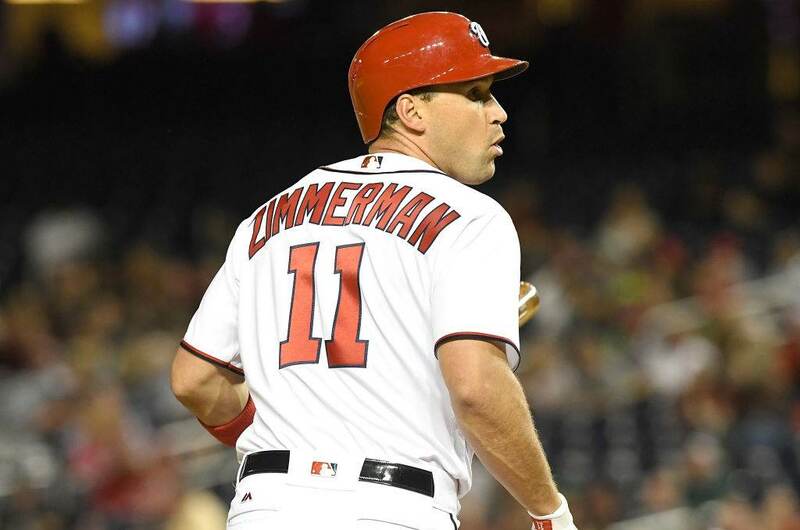 While the Nationals may have woken up from their April slump, they are loosing Zimmerman at the wrong time as he is currently the 10th National out of action due to injury. Second Baseman Daniel Murphy is due back any day now which is the good news for the Nats, but Outfielder Adam Eaton had surgery on his left ankle on Thursday and was placed on the 60-day DL Friday. Catcher Matt Wieters was placed on the 10-day DL on Friday as well due to a left hamstring injury and his timetable for a return is unknown. As mentioned earlier, Benoit’s timetable is unknown and he was placed on the 60-day DL in order to make a roster spot open for Reynolds. Concerns of Zimmerman heading back to the DL became more serious this past week when he missed five of the last seven games after playing the final two games of the San Diego series last week. Zimmerman said he was bothered by the injury after a couple of hard dives over the past week and both the team and Zimmerman felt that with the current timing, the best thing to do was not risk making the injury worse. “Some of those dives kind of made it worse, so it’s just to the point where I couldn’t sustain it for five months,” Zimmerman said. Martinez is also excited to welcome Reynolds up to the team as he feels he will help contribute right away to the Nationals offense. “Veteran guy. He has pop. He’s going to get a chance to play. I’m glad he’s here… He’ll definitely help us,” Martinez said. Reynolds was signed to a minor league deal by the Nationals following his release from the Colorado Rockies at the end of spring training. He hit .231 with one homer and four RBI’s in Syracuse before being called up. According to Martinez he will be an option at first base as well as third base and the outfield. Reynolds provides a veteran experience to the clubhouse as well as a player who can give you multiple options in regard to where he plays on the field. Reynolds will also have the opportunity to hit against some lefties according to Martinez, which favors him as he batted .347 against lefties last season. Surprisingly, even with the increase in injuries, the Nationals have been able to keep their hot streak going and bring themselves back to a top contender where everyone thought they would be in 2018. But the question remains, with players like Eaton, Murphy, and Zimmerman out as well as many others, how long can the Nationals keep up their impressive play? The Nationals will go for the four-game sweep against the Diamondbacks when they conclude their series tonight at Chase Field at 8:08 PM.